Peter Ho Davies's award-winning debut collection, The Ugliest House in the World, drew comparisons to the work of Raymond Carver, James Joyce, and V. S. Naipaul. The Washington Post hailed it as "astounding . . . Davies has left a unique, definitive footprint in the soil of contemporary short fiction." In his new collection, Davies's unforgettable characters—a Chinese son gambling with professional mourners, a mixed-race couple who experience a close encounter—strive for a love that transcends time, race, and sexuality. These are the stories of a sandwich generation—children of one century, adults of the next—caught between debts to their parents and what they owe their own offspring. 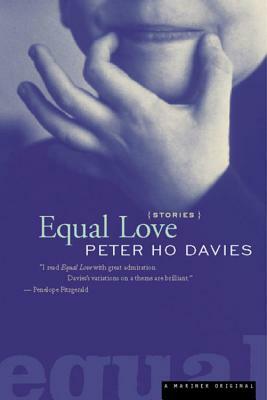 Shot through with humor and grace, Equal Love confirms Davies's reputation as one of his generation's foremost writers. PETER HO DAVIES is on the faculty of the graduate program in creative writing at the University of Michigan. His debut collection, The Ugliest House in the World, won the John Llewellyn Rhys and PEN/Macmillan awards in Britain. His second collection, Equal Love, was hailed by the New York Times Book Review for its “stories as deep and clear as myth.” It was a finalist for the Los Angeles Times Book Prize and a New York Times Notable Book. In 2003 Davies was named among the “Best of Young British Novelists” by Granta. The Welsh Girl was his first novel and his second, The Fortunes, was published in September 2016. The son of a Welsh father and Chinese mother, Davies was raised in England and spent his summers in Wales. "I read EQUAL LOVE with greeat admiration. Davies' variations onnnnnn a theme are brilliant, with very complex feelings, often indicated by seemingly small actions, so that the comparison with Joyce's PORTRAIT OF THE ARTIST AS A YOUNG MAN is justified (for once)." -Penelope Fitzgerald, author of THE BLUE FLOWER, THE BOOKSHOP, etc. "EQUAL LOVE has many moments of humor and sweetness despite its somewhat wistful visioun of human happiness. Love itself is seldom parceled out equaly or deservedly. But the attempt to achiecve some sort of precarious balance affords Davies the opportunity for much thougtful storytelling."